The world's first detachable workstation? The Pro x2 is a 2-in-1 detachable, with Wacom AES pen included. It's unclear from the information provided whether the HP Sprout Pro supports the HP Active Pen or the Adonit Jot Pro which may be pictured here and is referenced in the Sprout Pro's educational site. The unique HP Sprout Pro gets a hardware refresh at CES 2017. The HP Spectre x2 and the new Active Pen with App Launch: are they compatible? I had to find out. As is often the case when it comes to the intriguing world of ActiveES pens, the HP website's compatibility information isn't entirely accurate. As you read this review, you should know something up front: the deal I got on the HP Spectre x2 12-inch tablet may not be available to you. I scored a $200 discount on the $799 tablet at Best Buy, which makes it feel like a great bargain, standing head and shoulders over the similarly priced Surface 3 and Toshiba dynaPad. If I paid full price and then had to fork over another $60 for the pen, I'd have to compare the Spectre to the Surface Pro 4 and I'm not so sure that the tablet comes out ahead in that competition. The Best Buy sale is over as I write this and the Spectre x2 is once again selling for $799 (a Core m7 version, with 8 GB RAM/256 GB SSD lists for $1150). HP is also marketing the nearly identical Elite x2 1012 tablet starting at $899, so it's entirely possible that the Spectre x2 may soon disappear from store shelves altogether. Upon first inspection, the Spectre x2 is a silvery Surface Pro 4 clone. And the specs are virtually identical to the entry level SP4: Intel Core M3-6Y30 with Intel HD Graphics 515, 4 GB RAM, 128 GB SSD, 3:2 aspect ratio display, adjustable kickstand, detachable keyboard cover. The Sx2's display resolution is lower than the SP4: only 1920 x 1280. But the solid keyboard cover is included in the base price, as is Verizon LTE antenna. A Wacom Active ES pen is optional (it's standard in the Elite x2). The bundled keyboard cover is excellent. It's much more rigid than the Microsoft type cover and its island keys provide a great typing experience. The trackpad is also roomy and responsive, though not quite glasslike. The specs say that the keyboard is backlit, but I couldn't get my keys to light. (UPDATE: You just need to press F5 on the keyboard to toggle the backlight on and off. Duh.) The keyboard is cloth backed, similar to a Surface Pro type cover. The gaudiest design cue of the Spectre x2 is the speaker grill that runs along the top of the keyboard. Quad Bang & Olufsen speakers provide a surprisingly nice audio experience for a tablet, with two on the keyboard and two on the tablet's sides. This isn't something I normally mention, but after the dreadful speakers on the Toshiba dynaPad, audio is suddenly top of mind. The back of the tablet (above) is also distinctive (or over-done depending on your point of view). I don't care for the black accent at the top of the tablet. In these images, the "natural silver" finish looks more sedate than it truly is. The highly reflective chrome-plated kickstand is recessed in the tablet back and released via a latch on the lower left side of the display (see below left). Unlatching and then extending the kickstand takes some getting accustomed to, but the support is very good at a variety of angles. This side of the Spectre x2 also contains a headphone jack, volume buttons, and one of two USB Type-C connectors. The right side of the tablet (below) contains a second USB Type-C connector, SIM slot and a microSD media card reader. The Spectre x2 is very thin (.31 inches) and weighs 1.84 lbs. With the keyboard, the combination is .52 inches thick and weighs 2.68 lbs. The combination of rigid keyboard and freely adjustable kickstand make the Spectre x2 the most lap friendly two-in-one tablet I've tested. Performance is very good, performing neck and neck with the m3 Surface Pro 4. Looking again at these results, it's clear why I was so disappointed by the performance of the Toshiba dynaPad! The TabletMark performance of the SP4 is interesting but I have been unable to re-run those tests. The benchmark keeps hanging inexplicably on that tablet It's the only software I'm having trouble running on the device. Unlike the dynaPad and Surface Pro 4, the Active Pen is sold separately for the Spectre x2, retailing for $60. You can order it on the Best Buy site or direct from HP. Although the Spectre x2 is compatible with other Wacom Active ES pens, I thought it was important to test the native pen as well. Unfortunately, the results are very disappointing, mostly due to its poor form factor. Significantly smaller than either the TruPen or the Surface Pen (see below), the HP Active Pen, feels more like a crayon in my average sized hand. It also ships without replacement nibs. I recommend using Toshiba's latest generation TruPen if you can find it sold separately. 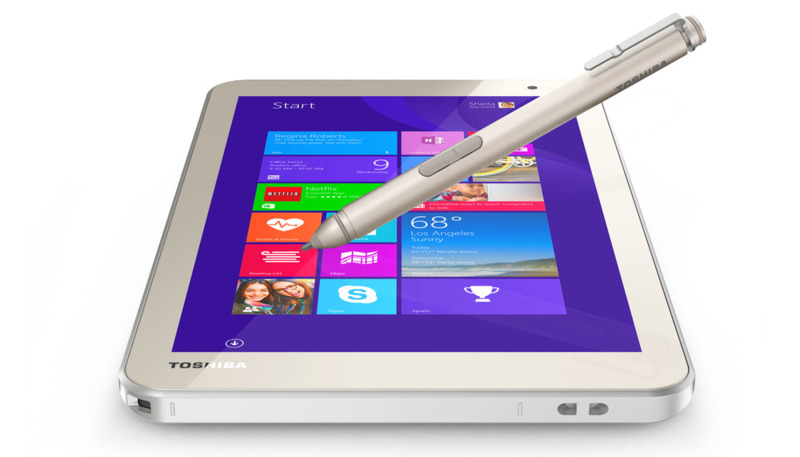 Although it didn't work as well as the TruPen, you can also use Lenovo's Active Stylus, which is more readily available. Hover distance is not as good as Toshiba's dynaPad, but it is better than previous generation AES devices. (UPDATE: in ascending order from approximately 1 mm to 5 mm, here are the hover distance results: Dell Active Stylus, Toshiba TruPen (Encore 2 Write), Lenovo Thinkpad Active Stylus, Toshiba TruPen (dynaPad) and HP Active Pen). Pressure response is excellent as I've come to expect from all Wacom Active ES pens. Due to the thinness of the display, if you press down hard with your pen, you will see a purplish ghosting as you draw. I found this pretty distracting and mitigated the effect somewhat by adjusting my pressure curve in Clip Studio Paint. Unfortunately, if your software doesn't offer pressure adjustment, the Wacom feel driver is not yet compatible with the Spectre x2, so there is no way to increase or decrease the pen tip's sensitivity or map the pen buttons. Worse still, without a driver, there is no way to make the tablet Wintab aware, That means that users of older software that requires Wintab for pen pressure are out of luck. I tested the Spectre x2 with both its native pen and the Toshiba TruPen in Clip Studio Paint, Sketchbook Pro and Sketchable and didn't have any issues. One behavior I noticed by juggling between pens is that it appears Wacom Active ES pens interfere with one another when handled in close proximity. Starting work with the TruPen, for example, appeared to cancel out the HP pen. I had similar results with a Dell pen that refused to work once the TruPen was connected. I also saw errant lines and strange wobbles when using one pen while holding another. Has anyone else seen this behavior? (UPDATE: To switch pens, a reboot is required in order for the tablet to sense the new pen with a tap or two on the display). To sum it up, if you can find the HP Spectre x2 on sale for at or below $600 (and you can live without Wintab compatibility), I recommend it over the similarly priced Surface 3 or Toshiba dynaPad. At its $800 list price, I recommend you look instead at the Surface Pro 4 or HP Elite x2 1012. Isn't it great to have this abundance of choice? Lisa Gade of MobileTechReview has just published an excellent video walkthrough confirming that the very stylish HP Spectre X360 ships with a Synaptics digitizer and supports the HP Active Pen (sold separately). The 13.3-inch convertible laptop starts as low as $899 for an Intel Core i5-5200U with 4 GB of RAM and 128 GB storage and tops out at $1370 for a Core i7-5500U with 8 GB of RAM and 512 GB SSD. All the models feature Intel HD Graphics 5500. From the looks of Lisa's demo, Synaptics has come a long way in the last year. The biggest drawback for most will be the lack of Wintab drivers for older software. Lisa Gade tests out the HP Active Stylus digital pen with the HP Spectre X360 Windows 8.1 convertible Ultrabook. The Spectre X360 is compatible with the same pen that HP offers as an optional accessory for the HP Split x2, though they don't publicize this feature.